Featuring silky smooth travel in a new lightweight design, Monarch floats through bumps even better than before, turning rugged trails into tire-gripping velvet. The chassis is lean while maintaining the durability and adjustability needed to bite off huge chunks of burly trail action and epic cross country. Features : WEIGHT 215g DAMPING External rebound, 3 position compression (Open/Pedal/Lock) CONFIGURATIONS 152 X 31, 165x38, 184x44, 190x51, 200x51, 200x57, 216x63 REBOUND DAMPING Rapid Recovery SPRING Standard, High Volume, Standard with High Volume Eyelet, High Volume with High Volume Eyelet, DebonAir SPRING ADJUST Air pressure via single Schrader valve SHAFT MATERIAL 7075 Aluminum - Fast Black SHAFT DIAMETER 10mm BODY MATERIAL Aluminum BODY FINISH Color Option: White UPGRADE Over RL: 3 Position Floodgate lever CHASSIS Clear hard anodized with sag gradients Technologies : Debon Air™ it increases the volume of air in both positive and negative welcoming rooms. This results in a greater reactivity of the shock at the beginning of compression and better sensitivity to small impacts. Sag Gradients™ Don’t set your sag correctly, and you might as well be hopping onto someone else’s bike. But why bust out plastic clips or rulers to keep your suspension fine-tuned? Our sag gradients are printed right on our fork’s upper tubes and shock damper bodies making perfect suspension setup easy and accurate. So give mom back her plastic clip and ruler. 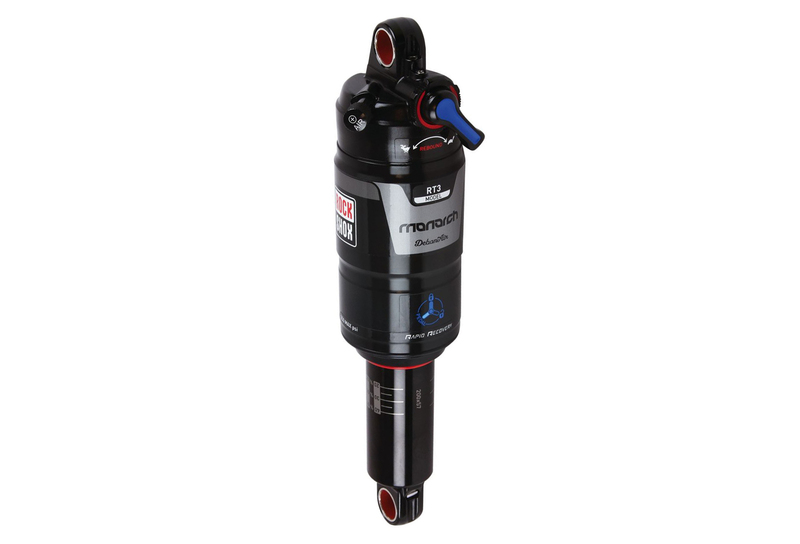 ROCKSHOX Amortisseur MONARCH RT3 DebonAir Mid Comp Noir clasificado 4.6 de 5 por 79.